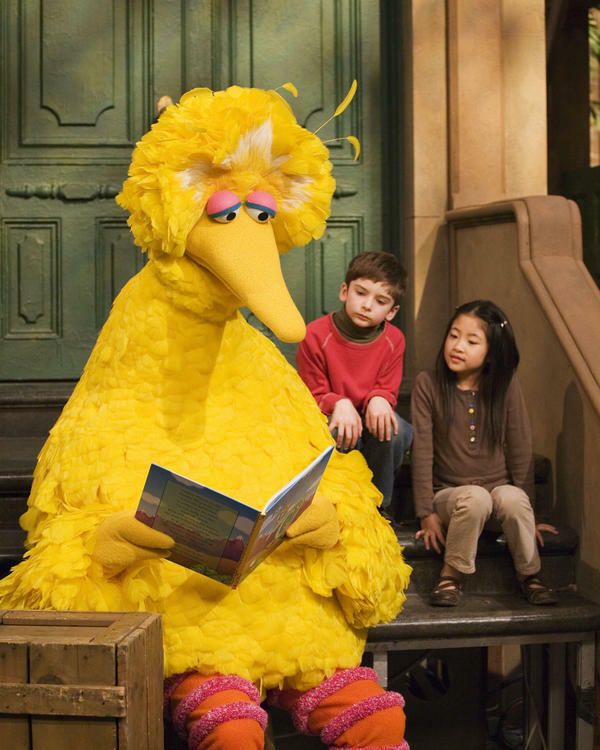 Big Bird, played by puppeteer Caroll Spinney, reads to Connor Scott and Tiffany Jiao during a taping of Sesame Street in 2008 in New York. Will Grover's promotion to HBO be good for kids? Elmo, Snuffy, Grover and Big Bird could soon hit the HBO after-parties alongside Tyrion Lannister and the ethically challenged cops from True Detective. Promising a win-win for kids and quality children's programming, HBO, the nonprofit Sesame Workshop and PBS have announced that new Sesame Street episodes will move to HBO and its streaming service HBO GO this fall. The five-year deal will allow Sesame Workshop to produce more episodes (up from 18 to 35 a season) and to expand its puppet-related kids content with new shows and spinoffs. As new episodes and new content go behind a premium cable pay wall, will low-income kids who might not be able to afford HBO now have trouble getting to Sesame Street? For parents and educators, that's a big question. Since 1969, the show has played a big role as an educational service with a mission to serve the underprivileged. We reported in June on research showing Sesame Street helps children learn, improves school readiness and can have a lasting academic impact. Kids who watch the show are a lot less likely to fall behind in school. The study found the long-term academic benefits almost equal to the federal pre-K program Head Start. Positive effects were especially noticeable among disadvantaged children. As PBS noted in its terse press release on the news, citing Nielsen, "PBS stations reach more kids aged 2-5, more moms with children under 6 years old and more low-income children than any other kids TV network." PBS spokeswoman Anne Bentley insisted the new deal "does not change the fundamental role PBS and stations play in the lives of families. Sesame Street will continue to air on PBS stations as part of the PBS KIDS service, building on a 45-year history." PBS is also launching two new kids programs later this year, Nature Cat and Ready Jet Go! said Bentley. She added that PBS remains "committed to bringing more impactful programming to more children, parents and caregivers." Sesame Workshop CEO Jeffrey Dunn said in a joint statement that the new partnership "provides Sesame Workshop with the critical funding it needs to be able to continue production of Sesame Street and secure its nonprofit mission of helping kids grow smarter, stronger and kinder." It seems like a smart move for HBO and Sesame Workshop in the digital era, when viewers have all but overthrown the tyranny of network programming clocks. Viewers want to watch when they want on what device they want. And, with the rise of competition from on-demand and streaming services, including Amazon and Netflix, outside revenue for Sesame Workshop was in the potty. Licensing deals including foreign rights, DVDs and toy sales make up most of the group's revenue, with only about 10 percent coming from PBS. Income from those sources was hit hard by the rise of new viewing services and options. Sesame Street shows now accessible on Amazon and Netflix will soon go away under this new agreement.